MOSES LAKE — If you’ve noticed the heavy equipment digging trenches in the parking lot at Blue Heron Park, you may be wondering what’s going on. 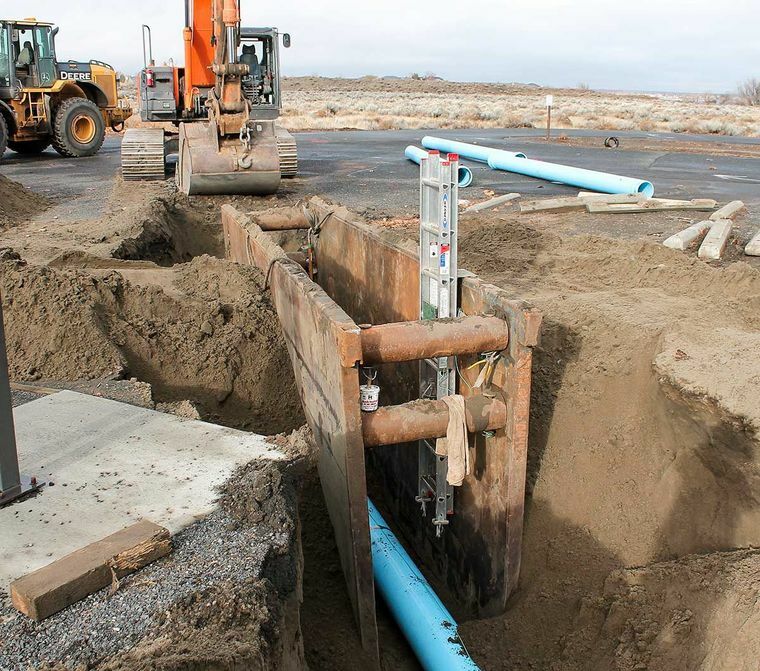 The work is part of a $739,000 sewer project the city of Moses Lake planned in preparation for the city’s anticipated expansion into Mae Valley. City Engineer Shawn O’Brien said the project includes pressure pipes, sewer pipes, a lift station, and a gravity sewer pipe. “There’s 1,800 feet of 12-inch pressure pipe to serve Mae Valley as the town expands,” he explains. The Moses Lake population grew from barely 12,000 in 1990, to nearly 17,000 in 2005, an increase of roughly 38 percent, according to the U.S. Census Bureau. That rate of growth has already been surpassed in the decade since, with an estimated 21,713 people calling Moses Lake home in 2014. Moses Lake saw more growth in 2015, with national retailer Marshall’s opening a store on Stratford Road and AstaReal announcing plans to invest an additional $30 million in its factory here. The city expects that growth to continue in 2016, as Mitsubishi will be conducting flight tests for their MRJ-90 at Grant County International Airport. This project alone is expected to bring about 200 engineers to the Moses Lake area, and with the airport restoring passenger service in March, more could follow. With concerns over increased traffic holding up the construction of Panda Express near Walmart, the city of Moses Lake is making sure that infrastructure won’t get in the way of future development. “We’ve got a generator project, replacing generators at six lift station/sewage sites, that we’re wrapping up,” O’Brien said. Those generators will keep the sewer lines running smoothly in the event of a power outage. The sewage project will enable the city to handle the city’s wastewater. O’Brien said a drilling project for three potable water wells, plus a fourth for irrigation, was expected to be awarded at last night’s city council meeting.